John Thomas Playfair, known as Thomas, was born at Earls Colne, Essex, England, on 4 January 1832. His mother Mary Anne Arnold was also a native of Essex, and his father, Thomas Playfair, gave his birthplace as St Andrews, Scotland, at the time of his marriage to Mary Anne, but no record has been found of his birth. Thomas Playfair (senior) gave his profession as a tailor, and a a publican, at varying times. Thomas Playfair (junior) joined the British Royal Navy at the age of 12 in 1845, and served on a number of ships including Hecla, Tyne, Rattler, Hecate, Asia, Swift, Brisk, and finally Pelorus, on which ship he traveled to Melbourne as Wardroom Steward, arriving on 30 September, 1859. Here he was voluntarily discharged, and almost immediately made his way to Sydney, arriving there on S.S. London on 7 October, 1859. In 1860 Thomas formed a partnership with Edmund John Bailey, a carcass butcher, trading as Bailey and Co. In the same year he married Ellen Matheson, a younger sister of Baily's wife Margaret. 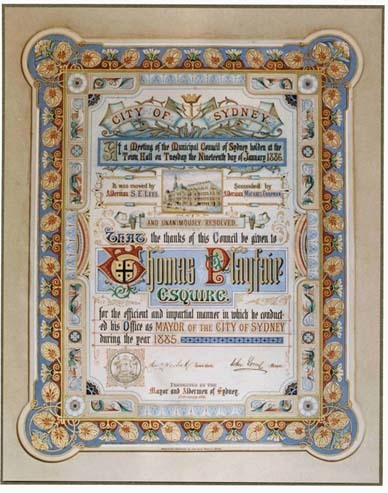 In 1860 the partnership purchased the Shipping Butcher business from George Read at 107 George Street Sydney and traded as Baily and Playfair. After Bailys death in 1862, it appears that his wife Margaret sold his interests in this business and the shops at South Head Road and Crown Street to Thomas Playfair. After the death of Ellen Matheson, Thomas married her half sister, Georgina, in 1867.